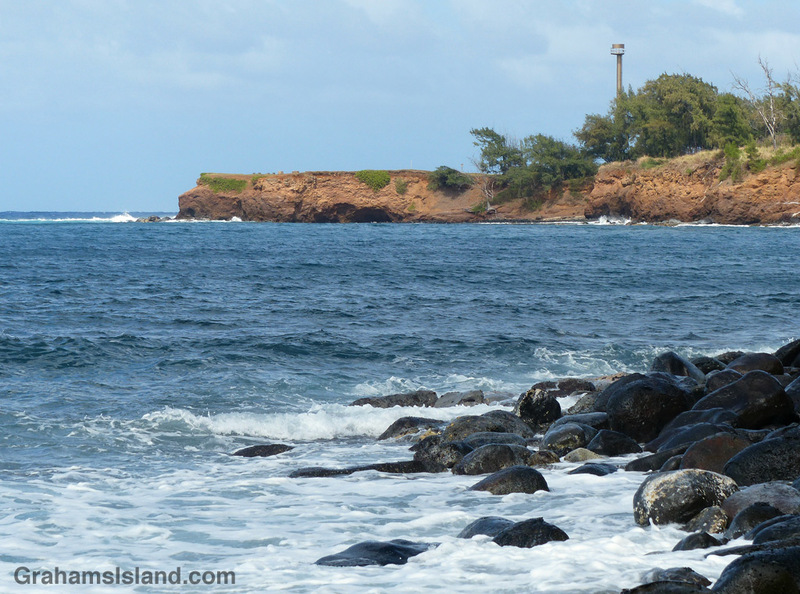 The Kauhola Point lighthouse is a modern affair, an automated light atop a tall metal pole. It replaced the previous, more traditional-looking lighthouse that was demolished in 2009. In the photo, the old base of that lighthouse can still be seen as several small block shapes toward the tip of the point. Therein lies the story. The old lighthouse was demolished because erosion was eating away at the land near the base. The passing of time will surely remove even these remnants in the next few years. In a way, this situation is a microcosm of the whole state. Many people think of the state of Hawaii as the eight main islands at the southeast end of the chain, but it encompasses hundreds of islands stretching away to the northwest for more than 1,500 miles. These small islands were formed over the same hotspot that fuels Kilauea Volcano today, but as the tectonic plate beneath the islands moved northwest, so the islands stopped growing and began to shrink under the forces of erosion. Over time, they too will disappear one by one. I like lighthouses. We saw many lighthouses on the island of Saaremaa in Estonia. Can you also go up? I like lighthouses too. Older lighthouses appear to have such a connection with the sea, and the old lighthouse here was like that. Sadly, this one is just a metal pole with a light on top. No access unless you’re feeling adventurous. Pingback: Delta 150.000 | What's (in) the picture?